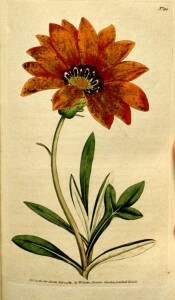 Hortus Camdenensis | Gazania rigens (L.) Gaertn. Herbaceous perennial with short branching stems, leaves entire or pinnatifid, to 12cm long, and large, showy flower heads, rays to 3cm long, orange with black eye. [RHSD, Hortus]. ‘The greenhouse, to which it properly belongs, can scarcely boast of a more shewy plant; its blossoms when expanded by the heat of the sun, and it is only when the sun shines on them that they are fully expanded, exhibit an unrivalled brilliance of appearance.’ [BM t.90/1789 as Gorteria rigens]. Introduced to Britain in 1755. [PD].